American musician, songwriter and actor. In a 1979 bam magazine interview he gave height as "Six feet tall". I have it on good advice he was 5 feet 10 inches tall. In that photo he can look 5ft 10ish, although Zappa may have bulkier heels on. Check out his appearance on the Steve Allen show: clearly nowhere close to six feet. I have stood next to Steve Allen and can confirm he was tall but not excessively, maybe 6'3" at the very most. Frank was very obviously considerably shorter. Between 5'7" and 5'9" I would estimate. I always thought he was 6'2" at least. I agree with mike he looked much taller. GO ZAPPA! Funny, he always seemed taller. Guess with his thin build, dramatic looks and larger than life persona he just had a bigger presence. Vai is indeed about 5'11.5". I met him at a masterclass, I'm 6'0.5" and he looked about an inch shorter than me. He's similar in height to Richie Kotzen, which I've also met (he's closer to 5'11" flat). They're both very nice guys, and great teachers! Rob, have you hear Zappa's music? if so, what do you think about it? In any case, Zappa is clearly taller than Vai by half an inch. (Revised) I have been a long time Frank Zappa fan (since 1964). 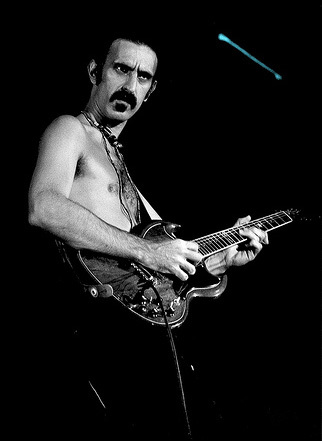 I have seen Frank Zappa live in concert 7 times and I doubt he is much taller than 5' 9". Clearly he is a Giant to me, but I doubt he is 6' tall. I have been a long time Frank Zappa fan (since 1964). I have seen Frank Zappa live in concert 7 times and I doubt he is much taller than 5' 9". Clearly he is a Giant to me, but I he is 6' tall. Zappa frequently wore boots with heels. He was also very slim which boosted the illusion of him being taller than he really was. Frank was 23 years old in the clip below and looks like a scrawny sub - 6 footer to me next to the supposedly 6'3" Steve Allen. Frank Zappa shows Steve Allen how to play the bicycle. Originally broadcast March 14, 1963.
oh,i misread.i thought you meant he was 5-7 period. Zappa was by age 11. Yeah, Beefheart hasn't had any public appearances since 1994. I think he's saying Zappa was 5'7 by 11.
who is 5-7? beefheart is in bad health for years. Somewhat lanky guy. Said he was 5'7" and well into puberty by age 11, too. I wonder how tall Captain Beefheart is. Always described as hulking, and he does look relatively tall in photos, but even more bulky.